Photo by Danielle Chastaine: Maple Elementary parent Charles Burrell tells the SPS Board of Directors he wants to see the school stay within its current boundaries, so his son won’t have to change schools during its meeting on Wednesday, Nov. 14. After a bus driver strike in February left Seattle Public Schools with a transportation headache, the district's board of directors contracted with a second bus company to provide a more reliable option for students. Students who rely on classic yellow buses to take them to class were stuck waiting longer than usual this fall, and were sometimes late to class at the beginning of the year. SPS contracts with First Student to take children to and from school in yellow buses, prioritizing students who attend Title I schools. Students can also receive ORCA cards to take Metro buses to class. Bus drivers went on strike for eight days in February during contract negotiations. An agreement was made after the strike, but not every bus driver came back to work for SPS. A contract between SPS and Durham Bus Service to bring an additional 15 buses to SPS was introduced during a board of directors on Nov. 14. The new buses were sent out on Oct. 29. • The SPS transportation department will continue to prioritize yellow bus service to Title I schools and for special education students. • SPS has subcontracted with a special education transportation contractor to expand services. • Additional ORCA cards have been provided to secondary students when requested by schools or families. • The transportation department convened a Transportation Task Force that includes transportation and school professionals, parents and community members. During the Nov. 14 meeting, the board considered approving the contract, which would allow Juneau to sign and execute the contract between SPS and Durham Bus Services. Since the addition of 15 buses, on-time rates rose from 88 percent of buses to more than 90 percent. SPS board president Leslie Harris said the district is keeping track of every late bus and other transportation issues, and SPS is notifying First Student of the issues. Even so, Harris lamented the district’s full agenda and made it clear creating an SPS-exclusive bus service would be too costly and time consuming. If SPS wanted to maintain its own bus league, it would cost a few million to start. A regular school bus costs $150,000 on average, and SPS would need to buy 300 buses to serve its students. This doesn’t include the cost to find space to store the buses and yearly maintenance of the buses. During the meeting, board members and Juneau thanked voters for passing a recent levy measure during the midterms. The board of directors will place two other levy measures on the ballot in February. Every three years SPS asks Seattle voters to renew two levies: the Operations Levy, also called the Educational Programs and Operations Levy, and the Building Excellence V Capital Levy (BEX V). SPS is staying busy this year with proposed boundary changes and school construction, such as the revamped Magnolia Elementary. • Fund day-to-day school operations, such as additional school staff beyond what the state allocates. • Help pay for instructional materials and textbooks. • Provide funds for special education to ensure the 7,000 students who need special education services have necessary support. • Help close the opportunity gaps by continuing to provide programs to support our most vulnerable students. • Safety and security measures at schools across the district. • A reduction in the number of portable classrooms. • More classrooms in schools. • Improved technology infrastructure in SPS schools. • Access to additional technology in the classroom. SPS's levy information states the two proposed levies will fill gaps left after state funding is received, even after the McCleary decision. Earlier this month Seattle voters approved Seattle Mayor Jenny Durkan’s Seattle Families, Education, Preschool and Promise Levy. More than half of the funds will be used to invest in preschool education while also improving K-12 health programs. 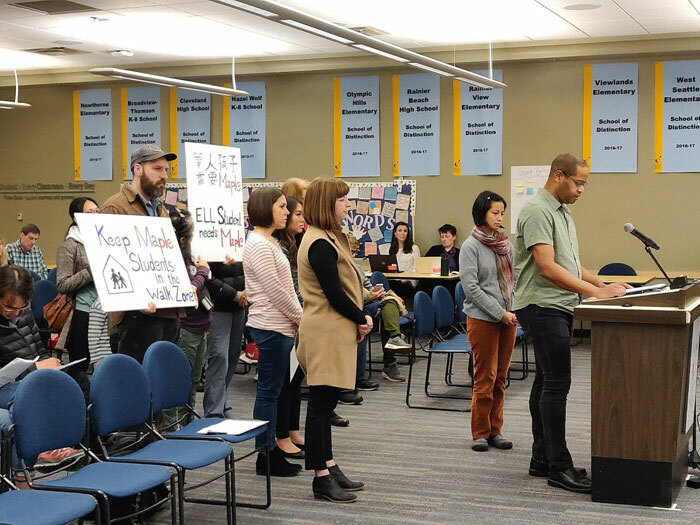 A collective bargaining agreement between SPS, the Seattle Education Association and Seattle Association of Educational Office Employees was ratified at the Nov. 14 board meeting. The agreement lays out contract terms for SPS’s paraprofessionals, non-supervisory employees and office professionals.